The BHS Self-Leveling Mobile Lift Table (SMLT) keeps workloads at a comfortable height continuously during loading and unloading. Protect workers and increase productivity by investing in this ergonomic, time-saving machine. The SMLT is made from heavy-duty, formed steel and has a durable powder-coat finish. Four urethane casters — two swivelling and two rigid — allow staff to maneuver the lift table wherever there is work to be done. The swivel casters are equipped with reliable brakes to secure loads in place. The SMLT has an adjustable spring tension with labeled gradations for quick and easy adjustments. As workers load or unload, the table adjusts to stay at the same desired, ergonomic height. Optional alternate tabletops can increase efficiency even more. Choose from a Ball Transfer or Roller Conveyor tabletop to replace the standard flat steel top. The SMLT meets ANSI Standard MH29.1:2012 for Industrial Scissor Lifts and complies with LMPS. The use of these Lift Tables can also help warehouses comply with the OSH Act of 1970. Contact our sales team at 1.800.BHS.9500 to learn more about BHS Mobile Lift Tables. Ask about customizations that tailor our heavy-duty lift tables to your specific requirements. 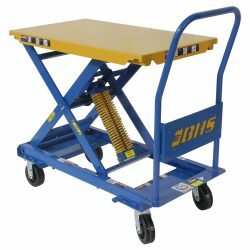 Improve safety and productivity with Self-Leveling Mobile Lift Tables from BHS. Two-way fork pockets allow fork access from side of unit for alternate form of transport. Tine locks secure unit to lift truck during tranport. * Option is bolted on for easy removal.